Cavities, also known as caries or tooth decay are an infection brought about by bacteria found in the teeth. Tooth decay and cavities are the number one dental problem and are also one of the major health conditions facing the world today. Despite much education on oral health and the advances in dental medicine, many children, teenagers and adults still suffer from cavities. When cavities are left untreated, they attack the tooth’s structure and could bring about severe toothache, an infection and lead to tooth loss. It’s therefore vital that you acquire good oral care practices. Regular dental checkups are also recommended. Various treatments are used to cure cavities and following highlight the treatment options you have. You may have heard of the word fluoride in toothpaste advertisements or seen it as an ingredient on your tab of toothpaste or mouthwash. Well, fluoride is an essential mineral in oral health. It helps in repairing teeth and can help arrest the early forms of tooth damage. If you have a developing cavity, fluoride treatment can not only help get rid of the bacteria, but also help restore the enamel. Fluoride treatments are administered in various ways and could be in the form of dental varnish, gel, foam or a liquid solution. The treatments are very short and take only a few minutes. It’s essential to note that the level of fluoride in these professional treatments is much higher than that of normal toothpastes and mouth washes. In addition to the treatment, your dentist could also recommend that you attend other fluoride treatments. Many of us have dental fillings, and this treatment also known as restoration works to replace the permanent damage caused by the decay. Various materials are used to make fillings and these include porcelain, composite resin and a combination of other tooth colored materials. There are silver amalgam fillings and these have been known to carry very small mercury amounts. Although medical studies reveal that the fillings have no side effects, not many patients are comfortable having the fillings due to the understandable fear of mercury. Before a filling can be placed, the dentist will first drill off the decayed area of the tooth and fill the gap with the filling in line with the shape of the tooth. Dental crowns are used when the decay has surpassed filling stage and weakened the tooth. Crowns are customized and fitted to replace the natural crown which is your tooth. The decayed area will need to be drilled off to ensure that the crown gets a good fit. Crowns are also made using various materials and there are porcelain crowns which resemble your natural tooth, metal fused porcelain and gold crowns as well. Root canal treatment is performed when the root canal which is the inner part of the tooth or pulp has been infected. 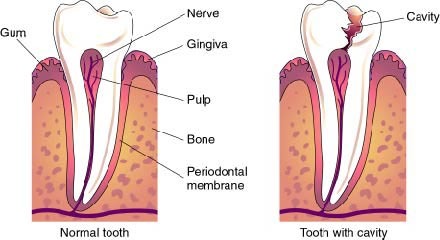 With root canal treatments, the entre pulp is removed before being replaced with a filling. Root canal saves the tooth from extraction and prevents further infection. Many people have said that this is a painful treatment. There are times when the tooth cannot be saved and the only option left is extracting the tooth. Tooth extraction is necessary in severely decayed teeth and this will leave the patient with a gap in the teeth. Tooth extractions often require subsequent treatment and this is because the teeth tend to shift. Most dentists recommend getting dental implants or a bridge to fill the gap. Ideally, you should brush your teeth after every meal. If that is not possible, rinse the mouth with water. Dentists recommended brushing the teeth twice a day using toothpaste that contains fluoride. Flossing daily is also important. Mouth rinses contain fluoride as an ingredient and dentists recommend that you use mouth wash especially if your chances of developing cavities are high. Dental sealants are protective coatings applied on the back of the teeth. These sealants cover up the crannies and grooves which tend to attract food particles. Sealants can protect the enamel from developing acid or plaque and they are highly recommended on school going children. Sealants can protect your teeth for about 10 years. Public water contains fluoride and this can help reduce your chances of developing cavities. Bottled water does not contain any fluoride. Snacking is a habit that constantly puts your teeth under bacterial attack. You should therefore avoid snacking. Whenever you consume sugary drinks, it’s safer to sip using a straw as this avoids direct contact between the drink and your teeth. This helps your teeth steer clear of mouth bacteria. There are foods that protect the teeth and this is because they contain calcium and hydrate the mouth thus increasing the flow of saliva. A good example of such foods is cheese, which is a great source of calcium. Fresh fruits and vegetables are also tooth-friendly foods. Drinks such as water, unsweetened tea and coffee can help wash food debris while sugar free gum can get rid of the food particles in your teeth. Fluoride treatments are great especially for people whose water doesn’t contain fluoride. Mouthwash and toothpaste are also good fluoride sources. Antibacterial treatments and mouth rinses are recommended to eliminate harmful mouth bacteria. Most people are unaware of cavities until they start experiencing toothache or see the signs of an infection. No symptom should be ignored and you also need to consider scheduling dental checkups and cleaning sessions to avoid cavities.